Harry Potter Golden Snitch Prop Replica | Nerd Much? 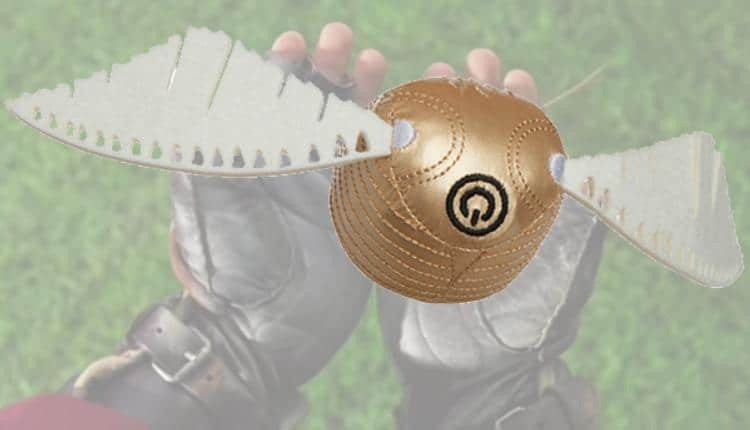 If you happen to be a part of the Quidditch team in your community, this Harry Potter Golden Snitch Prop Replica is for you. It is made to resemble the Snitch from the movie, but still soft enough to be safe and harmless to throw about. You certainly wouldn’t have a heavy snitch or an ill-made one that falls apart. This Harry Potter Golden Snitch Prop Replica features motion-activated sounds that can be turned on or off by the black stitched power button at the top. The sounds are the usually swish and flick noises from the movie. The Snitch is battery operated but there’s no replacing them unless you want to do undo a great deal of stitching. It is unfortunate, especially if you are using it to play Quidditch and it doesn’t end up lasting very long. Hopefully it will, however, and you won’t have to look for another one for quite some time. The Snitch is a little bigger than the movie version, measuring at 2.5 inches in diameter and approximately 10 inches long including the wings. A ThinkGeek states, the Harry Potter Golden Snitch Prop Replica is perfect for any occasion; whether you want to put it one display on a shelf, play Quidditch, or need a decent cosplay prop. Though this Snitch isn’t an exact replica of the the one in the movie, as much as it is advertised as such, this Prop Replica is perfect for playing a real life game of Quidditch with. Whether your a pro-player or not, it is soft and much less likely to be swallowed whole. For those interested in the real life version of Quidditch, it is an olympic sport now and will be included in the future summer games. It is unclear if it will be televised, but hopes are high. It will be interesting to see if the real life version is as exciting to watch as the wizard one.